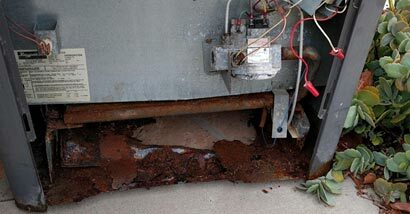 When we went out to look at the old Raypak pool heater, we did not know the true severity of the problem. The pool heater was extremely rusted through the bottom of the heater. Even though it was sitting on a setting pad, the landscaping and dirt were even with the pad. This enabled water to sit underneath the Raypak heater causing it to be severely damaged. This older pool heater or any pool heater will be damaged if not destroyed when there is any standing water. pool heater for many years they decided to go with Raypak again. They made a great choice as the Raypak 406A is one of the best pool heaters made. We like to install Raypak though heater recommendations can vary based on application. There are a few reasons to go with a different pool heater. How much space is there to work with? Is there a large wall to get over? 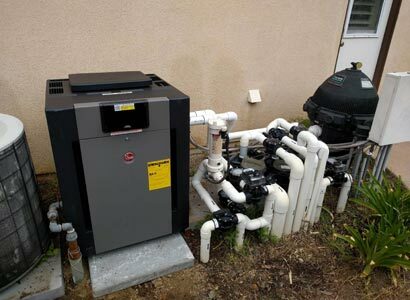 These are a few questions that would have us leaning towards a Pentair MasterTemp pool heater. If you have pool automation, you do not need to stay with the same company. All heaters are able to adapt to any type of pool automation. As this new pool heater installation is replacing the old Raypak was a good start. The pool plumbing was accessible and we did not need to replace any major valves. We set the new heater in place and on a new setting pad that was higher off of the ground. This will help in reducing the chance of standing water damaging the new pool heater. Once that was complete, we then installed the communication wire to the pool automation. The pool automation allows the heater and equipment to be controlled remotely. The gas line is then attached using galvanized piping that is very rigid.This is why we install the gas before the plumbing. Once the gas line is installed and the heater is in place, we can then line up the pool plumbing. Our technicians always want the installation to reflect the quality and professionalism we represent as a company. If you live in Poway or any other part of San Diego, we can help. 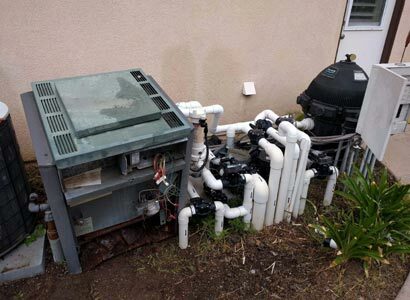 We provide pool heater repairs and new pool heater installation to Poway and San Diego County. If you are having problems with your pool heater please feel free to contact us anytime as we are happy to help.